When you see the word embroidery do you think kitschy kittens on potholders in grandmother's kitchen? Stop right there. 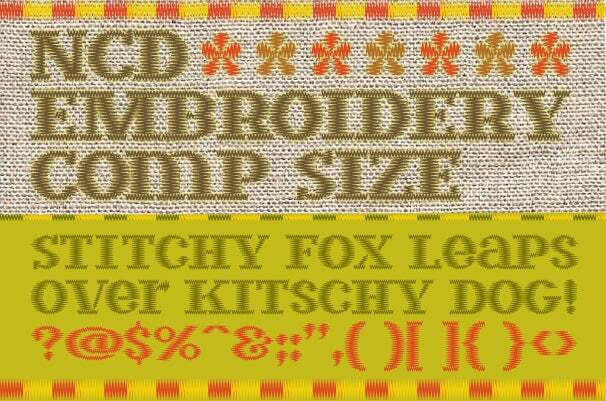 NCD Embroidery Comp Size, a font by London designer N Downey, is far from domestic. This display font is a rule-bending pixel construction with a touch of military style. What's the story? One day a graphic designer decides to reproduce an 18th century military jacket using his girlfriend's sewing machine to mimic historical embroidery. His project leads him to explore zigzag stitching formats even as he spots an announcement for the FontStruct Handmade Competition. Many hours of pixel manipulation later, Downey sends in his entry—a home-sewn style complete with punctuation! Downey has been a presence on the FontStruct scene since 2008, when he fell in love with typographer Rob Meek's brilliant online type-building application. Using FontStruct, designers can arrange collections of pixels (aka bricks) in gridded groups to create surprisingly diverse letterforms. The resulting "fontstructions" are then output in Truetype (.ttf) format for both Macs and PCs. A dynamic community of enthusiasts (aka FontStructors) meet on Meek's site to create, comment, share tips and custom bricks, and engage in friendly competition. In September 2010, Rob Meek staged a contest with FontStruct fans in mind. Could they break down FontStruct's systematic grids of bricks to create styles with hand-drawn visual appeal? Could they squiggle, scribble, and scrawl electronically? To meet the 32-pixel height limit, Downey chopped and sliced an earlier version of his NCD Embroidery font, then reworked the shortened forms deploying an inventive combination of stacking and compositing. The final effect matches the stabbing zigzag motion of his girlfriend's sewing machine quite nicely. What can be done with a font like this? Plenty, especially if characters are sized at 30 points or higher to take advantage of the style's stitchy lines. Use NCD Embroidery Comp Size to add a tailored touch to report covers or arrange to sleep in with custom "sewn" Do Not Disturb door hangers. When working with the set, mix the limited range of lowercase characters with caps for headlines and slogans with a playful feel. Since the smaller rotated "n" forms creating the serifs will begin to look less "sewn" in sizes above 60 point, try adding shadow or fill color behind the letters to unite small details with their main forms. With NCD Embroidery Comp Size, stitched-up font style is only a keyboard away. Use NCD Embroidery Comp Size to stitch up a look of your own. With a few sharp turns at the keyboard and a little custom tailoring, you're sure to find a fit that suits the job. Note: This story was updated on 9/16/11 to reflect that this font is no longer free. The previous link to it has been removed at the developer's request.